I recently became visitor 7,600,000-ish to the Great Smoky Mountains over the first week in November of 2015. There are approximately 9,000,000 visitors to the park each year which makes it the most visited National Park in the country, nearly twice as many as any other park in the country. 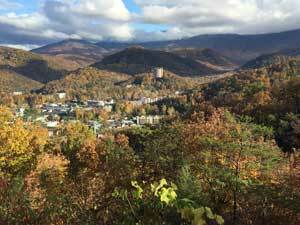 My trip took me to Gatlinburg, TN, considered the “Gateway” to the Great Smoky Mountains. As it turns out, it’s a great launching point to access the many attractions throughout the Park including; Cades Cove, Clingmans Dome (the second tallest mountain east of the Mississippi and the highest point along the Appalachian Trail) and Newfound Gap just to name a few. The Great Smoky Mountains were once the ancient homeland of the Cherokee Indians, descendants of the Iroquois of New England. They were driven out of their ancestral homeland by the Federal Government to Indian Reservations west of the Mississippi in 1838 as part of the “Indian Removal Act of 1830”on what is now known as the “Trail of Tears.” Approximately 2,000-6,000 of the 16,543 relocated Cherokee perished along the way. I am not writing this month’s Perspective as a history lesson per se, but more as a way to demonstrate that sometimes, even in the most commercial and “tourist trap” type of settings, it only takes a small effort to peel off the layers of modern civilization to see where we have come from, what our history tells us about who we are, and where we are going. Anyone who has ever visited this area is struck first by the 1-mile long stretch of arcades, candy shops, moonshine parlors and restaurants. On the surface, it is as garish and over the top as any vacation resort you have ever visited. What makes it unique is the rugged natural setting that not only surrounds it, but embraces it. If one were to spend their entire vacation on this one mile strip of honky-tonk hedonism, then one would be doing themselves a huge disservice. Literally just steps from the downtown area is the Parkway by-pass that runs east to west and over- looks the city to the south with the wide expanse of the Smoky Mountains acting as a natural backdrop to the cascading foliage and fauna that envelopes the area this time of year. It’s no wonder that the Cherokee and later, early settlers found this area to be a sacred and mystical place. It’s hard to imagine that now, but as I said, it’s a short drive or walk outside the city limits before you are transported to a more simple time. Remnants of early life in the mountains are all around. Abandoned log cabins, corn cribs and stables appear scattered throughout the park as reminders of a time long since removed from our collective memories. Even so, the lessons these simple buildings offer are as constant as the cool, fresh, clear water running down the mountain into the creeks and rivers that were essential to their survival. Like the Cherokee, early settlers made their homes along many of the rivers and creeks that run through the mountains here. Their homes were expectedly simple structures often times with just doors and few, if any, windows. Sometime broken into two different sections; one for the family to gather, eat and sleep and the other for cooking. The land is rugged, rocky, and steep and as such it is extremely difficult to cultivate for farming. All of the structures made in the early part of the 19th century are from old- growth forest that once dominated the landscape before the lumber industry destroyed nearly 2/3 of the forest by the early 20th century. The homes were situated to take advantage of the natural resources available on site and oriented to be sheltered from winters winds, rain and snow that can be extremely harsh in this part of eastern Tennessee. There are examples of modern structures in the area that have utilized old timbers and reclaimed architectural trim and stone for their own structures. Although only caricatures of authentic “mountain structures” they do keep to the tradition of using the natural resources available in the area to build and design from. What is most compelling about the history of this place is that we as a people realized at some point in the early 20th century that the ravages that were bearing down on this area were not sustainable. Something had to be done to keep what natural resource remained intact and here for future generations to enjoy. Franklin Delano Roosevelt started the CCC (Civilian Conservation Corps) in the middle of the Great Depression as a way of putting able bodied men to work for the good of the country. “The CCC was the first of several federal job programs designed to lift the nation out of the Great Depression. Created by President Franklin D. Roosevelt in 1933, the CCC employed three million men, most of them between 18 and 25 years old. Roosevelt declared their work “of moral and spiritual value, not only to those….taking part, but to the rest of the country as well.” Roosevelt went on to formally dedicate the park on September 2, 1940. The legacy of preservation is alive and kicking today not only in the Great Smoky Mountains, but all over our country. We as a people have realized, and perhaps not too late, that the great natural resources that make this country what it is are worth preserving for all future generations to enjoy and the sustainability of our planet.